The other day I got an email from an old friend for whom I have done some sewing projects in the past few years. She had a friend who was hoping to give her son an apron for Christmas and my friend thought I would be just the person to make that apron. A quick exchange of emails, a last minute trip to Joann's, and a few hours of sewing in my cozy basement sewing room on a cold winter day, then the best part...delivering the apron and visiting with lots of old friends just before Christmas! 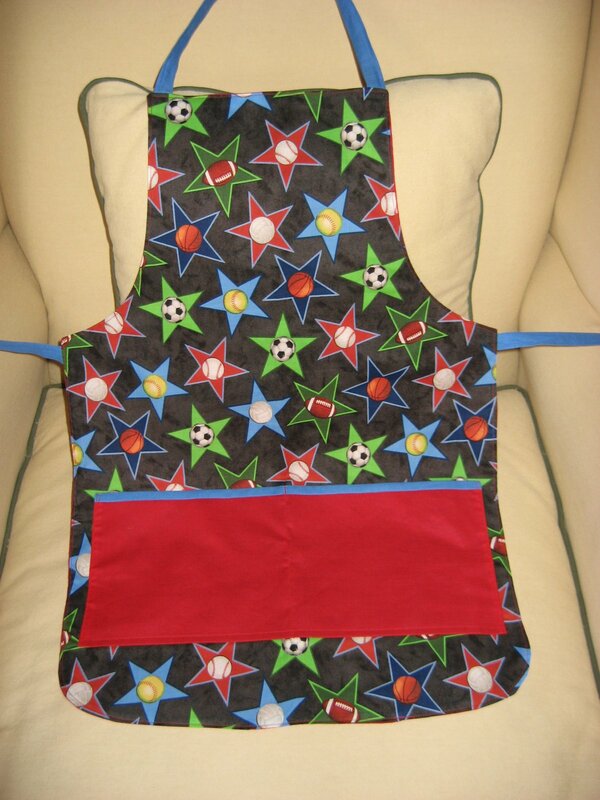 Here's the apron Thomas will be wearing while baking with his mom over Christmas vacation, but shhhh, don't tell! It's a surprise! 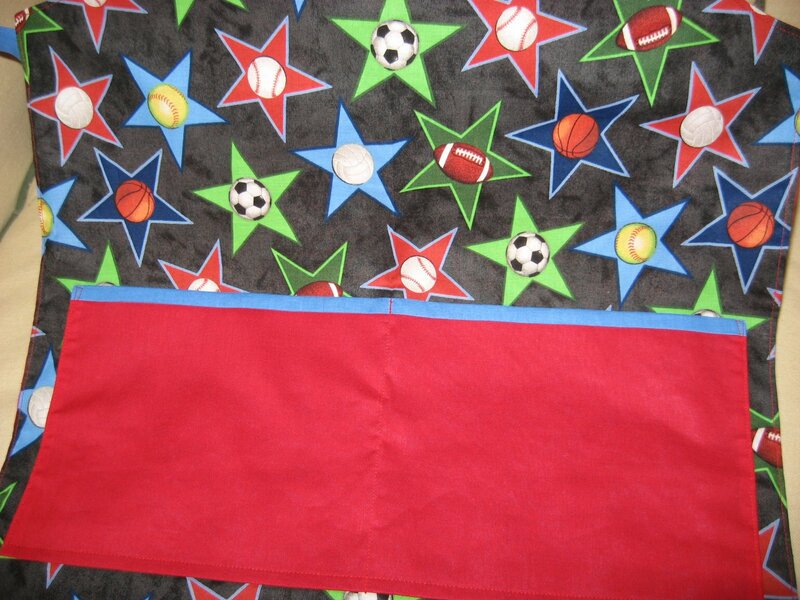 Thomas is a big sports fan and his mom suggested any fabric that had any kind of sports theme. 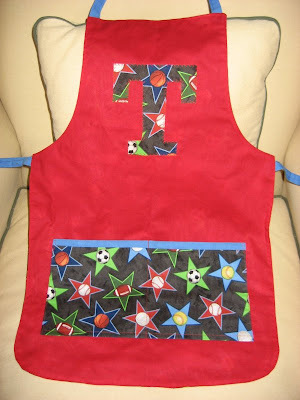 This one seemed to have all the major sports represented and I thought the colors were perfect for a 7 year old boy! 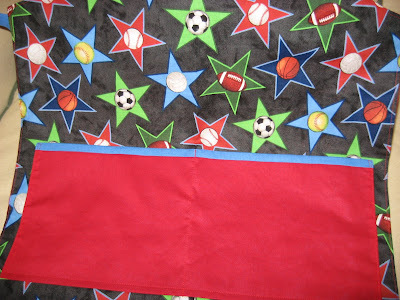 The pocket is divided into two and lined with the blue fabric. The apron is reversible too! T is for Thomas and as it turns out, red is his absolute most favorite color in the whole wide world, a fact I did not know until I gave the apron to his mother! I can just imagine the memories that will be made for Thomas and his mother while working side by side in the kitchen wearing his new apron! And I am so glad my friend didn't think I would be too busy for one more project right before Christmas! That is a lovely story for Christmas. You are a good friend! Happy Christmas. That's a great apron, but you are making me feel so guilt! I have a mother/daughter apron kit that I haven't yet made. Well, maybe if I finish the granddaughter's dress soon I can get to it. You are an amazing person Mary Grace. The apron is so perfect - and you are so very generous to offer and talent and time on such short notice - as I said you are amazing. From a mom of two boys who like to putter in the kitchen I think that is just perfect! Thomas will be so happy! I think it turned out wonderfully!